What should become of the Masonic Temple post-MTV? As was reported last week, the historic Masonic Temple building at Yonge and Davenport, presently the home of MTV Canada, is being vacated by its owners, Bell Media, and its future hasn't been decided. Formerly occupied by CTV, the Masonic Temple, despite its name, has a rich history as a concert venue. Many of the biggest names in rock have played here since the 1960s. The story of the sale so far is strikingly similar to that of Postal Station "K" up the street at Yonge and Eglinton. There, Canada Post is preparing to sell its famous art-deco property that stands on the former site of Montgomery's Tavern, possibly to developers. Naturally, there's outrage among locals and music fans who would rather see the building left untouched. Both the Masonic Temple and Postal Station "K" are partially protected by their designation as heritage sites by the City of Toronto. That doesn't mean either structure is completely safe in its present configuration. If sold, developers could, conceivably, build something that merely incorporates the protected aspects of each structure. "No firm plans are in place for the Temple," maintains Scott Henderson, Bell Media's VP of Communications. "We've been very proud owners of the building for many years and when we bought the building in 1998 we were very excited to make it into an animated destination and we're very proud of keeping that legacy going." Henderson says the current MTV studios at the temple were increasingly "orphaned" from other Bell Media operations at Queen Street. A lack of HD recording facilities and other production constraints on the Yonge Street property make it easier and cheaper to build new studios rather than renovating the Masonic Temple. "Our real estate department is evaluating the property and determining the best use for it. That may change as we move forward but currently we've made the decision to move MTV out and are determining what we do next." 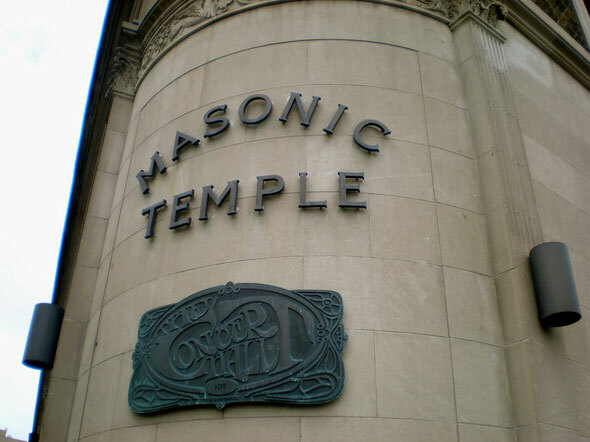 The Masonic Temple was built in 1917 at a cost of $200,000 to house various masonic lodges and chapters. A former Methodist Church on the site was demolished to make way for the new building which, according to the Toronto World, was "rushed to completion." From its first days, the new building doubled as a performance space. The first meetings were held on New Year's Day 1918 but in just over 12 years the building had been turned into a dedicated music hall. 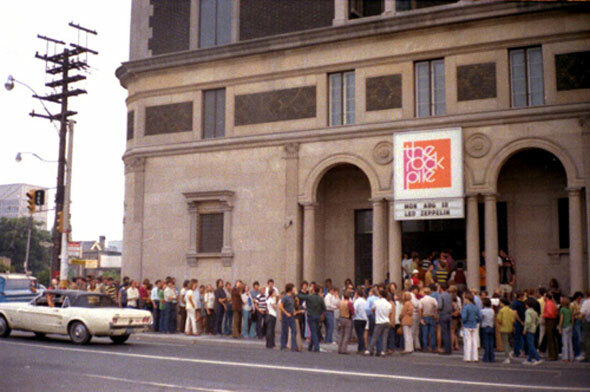 Known as the Rockpile in the 1960s, the Masonic Temple was the venue for Led Zeppelin's first Toronto show on their inaugural North American tour. Since then, it has hosted Soundgarden, Black Sabbath, David Bowie, The Pixies, The Pogues, Smashing Pumpkins, Red Hot Chili Peppers, Pearl Jam, Tin Machine, and multiple Polaris Music Prize galas. Under Bell Media, the building has hosted TSN's "Off the Record with Michael Landsberg," etalk, So You Think You Can Dance Canada and acted as the offices of Canadian Idol. If it were to be sold to developers or a company outside the media industry it would mark the first time in the Masonic Temple's 95-year history that it didn't have at least some connection to music or performance of some kind. What are your thoughts on this? Should Bell Media consider turning the Masonic Temple back into a performance space or would you rather see another use? Photos: "IMG_6886" by TOrebelXTguy under Creative Commons license, "Masonic Temple, Yonge and Church, Toronto" by pwete from the blogTO Flickr pool.